For no known reason my ice creams have stopped tasting good. At first I thought it was the recipe, but after watching Masterchef Australia I have learnt differently. Contrary to the instructions that came with my ice cream maker, do not slowly chill the custard base. This causes it to curdle and will make your ice cream have the most awful aftertaste and texture. I tried this recipe and I am going to use it again as a base for other flavours. I’m also addicted although I know who won! (I won’t tell!!) When you do open your books please post on George’s Olive Oil Chocolate Mousse. I never had time to take it down and have not been able to find it. I am intrigued by it and would like to give it a go at some point. Hope you having a super week. don’t tell! not sure which recipes are in there, I think they may be from the finals only. But for sure, if that recipe is there I will share it 🙂 Enjoy your week as well! Tandy where did you find the master chef books????????????? 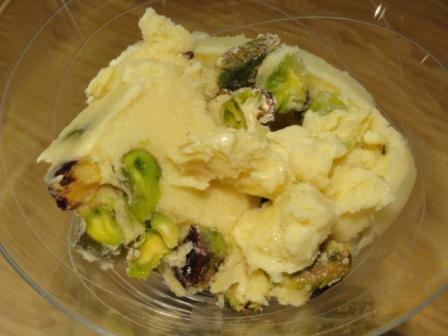 All that ice-cream needs is some roasted figs!!!!! Divine! Don’t look because that takes the fun away…it’s an awesome show…omg can’t wait for the next one!!! I keep mine in the freezer – mainly because I don’t have enough cupboards! That looks like serioulsy good ice cream. Are you also hooked on Masterchef Aus? ?